As my 5th grade class continues the pilot program for the 1:1 iPads which will be in place school-wide next year, we also continue the search for a great homework app. Of course, each student at my school is provided with an agenda book where they can write out by hand what their homework assignment is. There are of course pros and cons to this. In my classroom, I'm all about accountability and responsibility. So my philosophy was always that the students are RESPONSIBLE to write their homework down. Of course, as teachers we know that as wonderful of a philosophy that might be, it doesn't always happen. Which then leads to issues of parents not know what the assignments are, which leads to parent/teacher conferences to try and solve the problem which leads to me having to potentially check EVERY single agenda to make sure students have written down their assignments. And I'll be honest.....that's just not going to happen. Sooooooo.....in efforts to save time for us all, still make my students accountable but even more importantly inform parents of what assignments are so they can be sure to provide the support needed at home, I searched out apps for students to record their assignments. 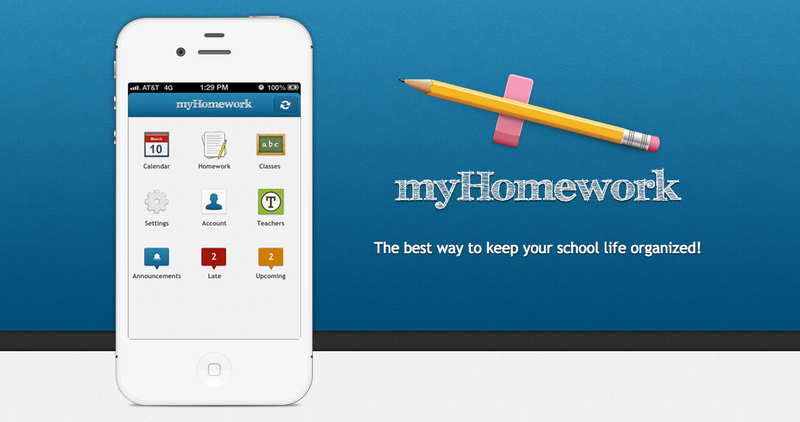 The first app we tested out was called iHomework. It was nice and had many cool features but I found that it was unreliable at best and didn't work for what I needed. Many times it would force close, didn't provide a link to parents, tended to confuse students on how to enter in assignments and on top of it all, cost $1.99 per iPad (of course you could get the educator discount if you bought 20 or more of it). Don't get me wrong - this is probably a perfect app for a high school students or even college students but for 3rd - 8th grade it didn't cut it. However, it may be perfect for some. So while my students had the option between using the iHomework app or using the traditional paper/pencil agenda, I continued to look. After doing some research I came across MyHomework. The app itself is free (however I think if you load it onto a computer it costs money). The app itself requires students to create a personal login and password (unlike iHomework). It does request that the students are 13 or older but with parent permission that isn't a problem. Students have the ability to create different classes (which is great for middle school students) and can enter in Lessons, Assignments and Tests. They can also download this app onto several devices and it will seamlessly sync between all of them which is what iHomework lacked. With this ability, my students' parents load the app onto their smartphone or device and login using their child's information. This way they can see what the assignments are and when they are due. However, this is only TRUE if the student is recording all the assignments down. This is where this app gets EVEN better! There is also a teacher component available as well (FREE). As a teacher, I can go in and create my class(es) and add in assignments, lessons, tests, announcements, syllabi, etc. Students can then search for me and "JOIN" my class. Instantly providing them with all the information I'm inputting. When I first signed up for this resource, I still made it the responsibility of the student to input their assignments in. But I found time and time again that a couple of my students just would not enter them all in. Which resulted in their parents still not knowing what was due and a lot of incompletes and zeros. I have since started to input my assignments in daily (it takes me less than 3 minutes!) and still makes my kids accountable for actually doing the work. Because when it comes down to it, I'd rather them be completing the work instead of just writing it in their agenda. Again, my students' parents see everything I'm putting in because they either are signed in as their child on their device or they created their own account and "joined" my class. How awesome is that?!?! When you sign up as a teacher, you need to first input your email and you'll receive an "invitation" via email. I'm not quite sure why the developer went that route but I found that I received my invitation in a matter of hours of requesting it. Students can sign up immediately. It just amazes me at what can be done with technology nowadays! Sometimes, it's even a little scary. I love the tech twist your blog seems to have and I am glad I found it. I am your newest follower! Look here for some useful information about writing college essays. Super Bowl Sunday - TpT Sale! !